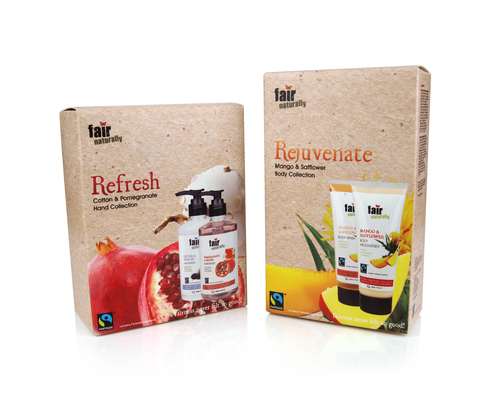 For clean skin and a clean conscience this Christmas, the new Fairtrade certified fair naturally ‘Refresh’ body collection and ‘Rejuvenate’ handwash gift sets from Sainsbury’s are the perfect choice. Featuring Fairtrade certified ingredients such as mango, melon and moisturising cotton extract, the new range leaves skin deliciously scented and nourished. Supporting producers and communities in developing countries, the ethically sourced ingredients are presented in fully recyclable packaging. The fair naturally ‘Refresh’ body collection features Mango & Safflower Body Wash (200ml) and Mango & Safflower Body Moisturiser (200ml). Fruity and invigorating, the formulation also includes Fairtrade certified cane sugar to soften skin and leave a beautiful sheen. The fair naturally ‘Rejuvenate’ Handwash collection includes zesty Pomegranate & Melon Handwash and moisturising Cotton & Olive Oil Handwash to gently clean and soften hands. The generous 300ml bottles are luxurious and long-lasting. High res images and further product information is available. This press release was distributed by ResponseSource Press Release Wire on behalf of Ad Hoc-PR in the following categories: Women's Interest & Beauty, Retail & Fashion, for more information visit https://pressreleasewire.responsesource.com/about. Ad Hoc-PR specialises in gaining effective media coverage for new and growing enterprises on an affordable, pay-by-results basis.